Training yourself to do something that feels unnatural is never easy, but it’s also never too late to learn an important skill. Balance is a focal point with our Active Aging population and something our residents are concerned with on a daily basis. Whether it be through designing exercise prescriptions to improve an individual’s balance, leading an educational presentation on aspects of balance, or leading a balance group fitness class, there are countless ways that we as professionals can attempt to help improve someone’s balance. We recognize the importance of balance because the longer someone can maintain this skill, the longer they are able to remain independent. However, with all of this time, energy, and work dedicated to balance, I notice the same issue coming up consistently: residents are constantly looking down at their feet while they move. When I moved to Virginia six years ago, I was finally in a place to fulfill a lifetime goal of mine: to own a motorcycle. I had no experience riding, I didn’t grow up around bikes, but I just was always fascinated by them and determined to learn to ride one. I am a cautious person, so before I did anything else, I participated in a Motorcycle Safety Foundation® Basic Rider course at a nearby community college. I learned many things during that course, but one lesson that has always stuck with me is instead of focusing on the road directly in front of your wheel, you should be looking down the road and keeping your eyes up. When you keep your eyes up and your focus ahead of you, you give yourself a valuable tool: time. This is a lesson I work hard to get my residents to understand. When we walk, looking down at our feet gives us a sense of security that we know exactly where our foot is going to be and what our foot is going to land on, but it comes at a price. When our gaze is down at our feet, we can’t see what’s coming. We give ourselves very little time to identify a trip hazard in our path or to plan a route to avoid uneven or unstable surfaces. Much like riding a motorcycle, when you keep your eyes lifted, you give yourself more time to determine your best route because your brain has more time to process what you are seeing and plan accordingly. When we know that there are consequences to our actions, we often are very careful with those actions because we know what might result if we are careless. This awareness and concern has had the unfortunate effect of teaching us that we should fear falling and avoid it at all costs, so we look down at our feet. 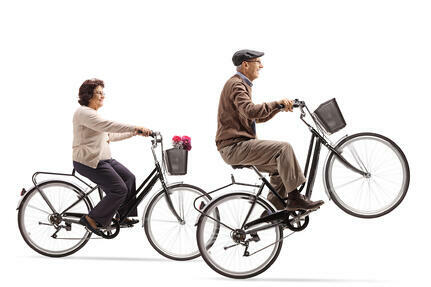 But just like riding a motorcycle, keeping your eyes up and looking well out in front of you may help you avoid obstacles, prepare for any balance challenges, and be safe through fall prevention. 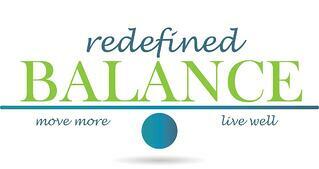 Interested in learning more about NIFS effective balance programming? NIFS premier fall prevention programming can help set your community apart from the rest. 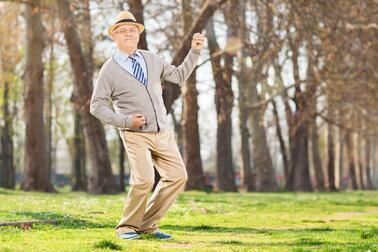 Falls are a big concern for senior living communities. Given the well-known statistics from the Centers for Disease Control and Prevention, it's easy to see why. The National Council On Aging provides compelling numbers as well. This is why we work so hard with our clients to establish robust, evidence-based, year-round programming that focuses on improving resident's balance and strength, as well as their self-confidence. One of the key elements for successful balance programming is drawing in as many residents as possible; we've found that the best way to accomplish this is through varied programming. It's not enough to simply put a balance class on the calendar. Communities have to take it one step further and offer other ways to interact. NIFS Balance RedefinedTM programming offers everything from fitness testing to classes that teach participants how to safely get up from a fall. We've spent years evolving these services as we responded to resident suggestions and evaluated our program data. Below are stories from residents whose lives have been positively impacted by the work our staff do. Despite losing her husband just a few days after they moved into the community, Ms. Weigle made a conscious choice to take that difficult first step out of their apartment to meet new neighbors, and within a few weeks someone invited her to try the Balance Class offered by the NIFS fitness center manager. She has been a faithful participant (and ambassador!) ever since and has expanded her lifestyle to include additional activities such as swimming, walking groups, gardening, and studying Spanish. Ms. Weigle takes her regular exercise so seriously that she’s told her family not to call in the morning on Mondays, Wednesdays and Fridays because she will be in the pool. When asked, she’s proud to share that through repeat balance testing with the NIFS manager, she is seeing her scores improve. At 87 years old, she thinks becoming steadier on her feet has helped her in other areas of her health. In fact, in a recent doctor’s visit, she was praised by her doctor for exceptional blood pressure, and she was pleased to share that ankle pain which had long bothered her was no longer a problem. When Mrs. Chapin moved to her community about ten years ago, she wasn’t new to exercise. With a COPD diagnosis almost 20 years ago, she started swimming laps, and even though she hated to exercise, she kept at it because she knew it was crucial to helping her stay well with a chronic disease. But when she and her husband moved into their community, she took a break from regular exercise to engage in so many of the other opportunities provided. She watched her husband’s health gradually decline, so she nudged him to join her for a Balance class, and they were regulars up until his passing last year. Through that loss, Mrs. Chapin felt the support of the members in her class, and was able to keep attending regularly. The social support in NIFS balance programming has been a significant and positive as she draws her social network from that group. Mrs. Chapin’s annual senior fitness evaluation confirms she’s on the right track with maintaining her balance, but more important than the numbers is how Mrs. Chapin feels. She told us that at 88 years old, she feels steadier than ever and she’s thrilled to still be sewing quilts and clothes, as well as painting, and serving on several resident committees all of which wouldn’t be possible if she wasn’t in good shape. Mr. Sadler never used to exercise. But when he moved to his community in 2009, his decision to start taking group fitness classes and using the pool proved valuable to overcome health challenges that were just around the corner. After a knee replacement surgery didn’t go as expected, he had to have the surgery reversed and replaced the joint with surgical concrete. Not only did that “fix” leave him unable to walk, he lost significant healthy muscle tissue as well. Following his release from physical therapy, Mr. Sadler was only mobile by scooter or wheelchair and he stopped attending an annual family beach vacation. He knew his only hope to return to more independence, and maybe to enjoying that annual family vacation again was to get back to a regular exercise routine. After working closely with the NIFS team at his community, he was able to regain significant strength and balance through careful water training. Eventually, he got back to land-based exercise as well and at 87 years old, he has resumed driving and walks confidently with a walker. In 2015, he joined his family again at the beach for their annual vacation. Mrs. Boelter was physical active as a regular water aerobics participant before she moved into her community in 2013. She was also an avid walker and all of that has continued with the help of the NIFS staff at her community. As her Parkinson’s disease progresses, she feels the importance of maintaining her activity level even more and shared that through regular personal training with the NIFS manager, she has more energy throughout the day. But most noticeably, she is more able to get moving in the morning compared to her previous routine. Mrs. Boelter noted that although she’s had a number of falls over the past 20 years since she was diagnosed with Parkinson’s disease, she’s had no major falls since she started working with the NIFS staff on her balance. She tells everyone at the community about the benefits of the classes and personal training; she’s a living testament to being able to maintain her independence with regular balance training offered at her community. Mrs. Moore has been active in the fitness center and with the NIFS staff at her community since she moved in 2004. More recently however, she participated in the NIFS Balance Challenge at the suggestion of the NIFS manager. Through a series of evaluations, education, and fun games, residents engaged in the Balance Challenge understand how to improve their balance as well as how to avoid and manage falls. New information on managing falls proved to be very timely for Mrs. Moore when she sustained a fall outside of the clubhouse. After she got her bearings, she was able to use skills she had learned from the NIFS manager during the Challenge to get up on her own without injury. She shared she’s been able to use what she learned through the program to stay active with gardening and to keep up with her grandkids too. She has also become an ambassador for all services connected with balance training at her community. It's really common for communities to have missed opportunities when it comes to providing comprehensive fall prevention programming. We can help you spot and fill those gaps to provide exactly what your residents need to feel steadier and confident on their feet. Click below for more information about a free consulting session with NIFS to jump start balance training at your community.